Now in its second year, the new CCA minor in Fashion has grown to just under 200 students and hopes to unveil a brand new curriculum this coming fall. 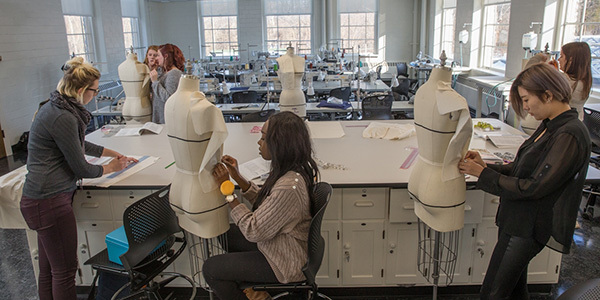 New faculty hires Della Reams (CCA) and Leslie Stoel (MKT) are spearheading a revised minor with dedicated "FAS" courses, as well as a co-major, and these programs uniquely stress the connection between fashion design and fashion business. Contributions by Miami alumnus Frederic Holzberger (‘77), founder of the Aveda Frederic's Institute—have allowed for new studio space to be constructed in Boyd Hall, and numerous Miami alumni connected to fashion have returned to campus to support the minor and the Miami Club of Fashion Design. MUCFD, under the leadership of President Maddie Rieman, hosted the 10th Annual Miami University Fashion Show on April 16th in Millett Hall, in front of a record crowd. The interdisciplinary minors in Arts Management and Arts Entrepreneurship, along with a new co-major in Arts Management, will accept new students beginning fall 2016. These offerings are a collaborative effort between the College of Creative Arts and the Farmer School of Business. Todd Stuart, director of these programs, has developed curriculum that blends a synthesis of art, creativity, innovation, management, and entrepreneurship. The coursework and internships required prepare students for work with non-profit and commercial arts enterprises—museums, art galleries, regional theatre, Broadway, concert promotion, artist management, symphonies, dance companies, community art councils, etc. New in 2016, the Museums and Society minor provides a critical understanding of museums as collections-based institutions. It is especially appropriate for students planning a professional career in education, libraries, anthropology, art or architecture history, or associated fields. Students in the minor gain hands-on experience with current methods and approaches in museum curation through research on objects, collections and collecting institutions. The program is led by Robert Wicks, director of the Miami University Art Museum. College of Creative Arts majors’ total graduation rate (PDF) in 2015 was 86%. Many CCA students as well as those outside of the college either double-major, co-major, or declare CCA minors as part of their Miami experience. 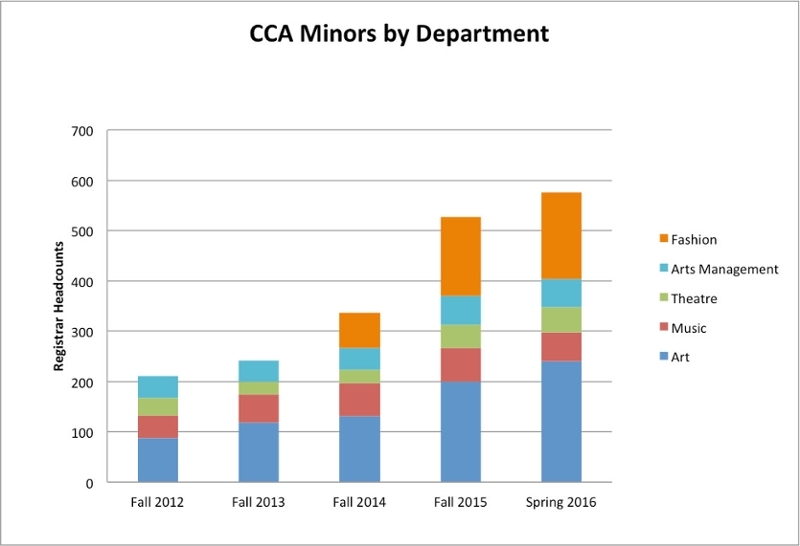 Growth of minors has leapt 280% from fall 2012 to spring 2016.